Unless you live under a really lame rock with no Wi-Fi, chances are you’ve heard of Grammy-nominated producer Diplo‘s Mad Decent. The label is a longtime purveyor of cool tracks from around the globe, including crossover successes such as outlandish rapper Riff Raff and festival staple Major Lazer. In 2011, the record label launched an imprint entitled “Jeffree‘s,” an intended home for original, innovative artists that has since become a hub for some of the most exciting acts out there. With alumni like Zebra Katz, Bro Safari, and Baauer (who helmed the viral hit “Harlem Shake”), it only makes sense that we select some of our faves from Jeffree’s newest offerings. Who: No stranger to this site, Liz is an admirer of the R&B and pop from the 2000s, an element of her style that shines through via her ultra-catchy hooks and nostalgia-inducing production. The former girl group member has had longtime success as a behind the scenes player, but recently stepped in front of the spotlight with sultry, shimmering tracks like “Stop Me Cold” and the Ryan Hemsworth-produced “Day N’ Nite.” The Song: Liz’s newest, produced by Mad Decent players Mr. Carmack and Colta (also of production collective Team Supreme), leans more towards R&B vocal house than her usual repertoire, a slick hybrid of past and present sounds. 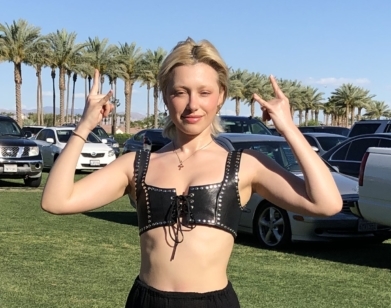 Her phrasing fresh and her singing smooth as butter, Liz seems more than ready to take her radio-worthy sound straight to the top.Current Project: Liz just wrapped a tour with Charli XCX. Keep up with her via her Facebook page. Who: Hailing from Kingston, Jamaica, Craig “Leftside” Parks is a Renaissance man, touting the titles of musician, songwriter, and producer. Melding together multiple genres, Leftside’s versatility is apparent—if you want proof, watch his videos for the ballad pop-infused “Cry Fi Yuh” and the club-ready “Want Yuh Body” (featuring Sean Paul). The Song: Leftside shows yet another layer with “Monkey Biznizz,” a track that bangs despite (and because of) its bareness—a sample of a monkey laughing becomes the beat’s melody, with an auto-tuned Leftside delivering punchline after punchline. Who: A big name in the world of Philly Club music and beyond, this young talent has impressed many with his standout approach: Swizzy’s production takes the typical formats for genres like trap and Philly Club and flips them on their head, infusing sounds from the future with today’s textures. The Song: The Notorious B.I.G.-sampling “Money Drop” finds the producer in trap territory, a laidback melody accompanying the buildup. Before you know it, the beat hits hard and heavy, with Biggie commanding the listener to “drop” over some big, bad drums. Current Project: Keep up with Swizzymack shows and songs via his Facebook page.